The company says this high quality brand of air tools has a well-established global presence and arrives in the UK at a very competitive industry price. Products have been designed ‘For Engineers- by Engineers’ using state of the art technologies, manufactured for prolonged use and improved longevity. Every tool is manufactured using lightweight, high-strength materials with heat-treated components for maximum durability. 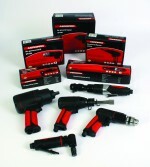 All tools are supplied as standard with a 12 month manufacturer’s warranty.